Funny fact: I’ve checked through Carlson’s reception in peer-reviewed journals, and, to my surprise, many scholars are explicit that the handwriting is the best part of his book. Now, when Jeffery, too, has all but abandoned this line of enquiry, almost nothing remains of the original hoax hypothesis. And if we allow that somebody else than Smith could have forged the letter, the plot thickens way too much and makes ever less and less sense. This is my gut feeling also. Whenever Carlson’s book was referred to, it was “always” the handwriting which formed the strongest part of the evidence. Now, I cannot really imagine, having read only parts of Jeffery’s book, how Jeffery never imagined that Smith himself penned the letter? How on earth did he then think the forgery was made? A companion seems to be utterly improbable. And a colleague who would set Smith up seems even more improbable. And finally an 18th century forgery totally changes everything Jeffery has argued for, which is that Smith was the counterfeiter. 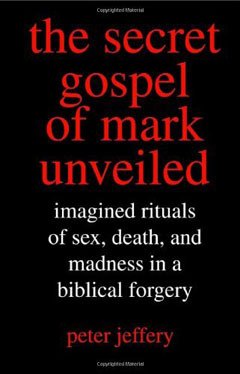 It is most natural to read Jeffery’s book with the assumption that Smith penned the letter himself, or at least nothing contrary to this scenario is ever mentioned. I just searched through the book, and true enough, couldn’t find a clear statement that it was by the hand of Smith that the document came into existence. Jeffery doesn’t concern himself with that practical question. But, like you said, the alternative scenarios are even more unbelievable. Though as far as Chapter 7 Jeffery concludes that ”We cannot, at this point, exclude the possibility that Smith really did discover a text he did not compose” (p. 183)”, but I guess this is due to the difficulties he confessed to have had in deciding which chapter comes after which. In any case, if Smith was not the culprit, at least half of Jeffery’s case falls right out.